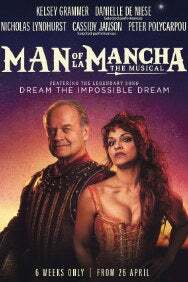 Featuring the legendary song, The Impossible Dream (The Quest), Man of La Mancha& is inspired by Miguel de Cervantes’s masterpiece novel Don Quixote&. This uplifting, timeless tale stars Kelsey Grammer, Danielle de Niese, Peter Polycarpou, Nicholas Lyndhurst and Cassidy Janson, from 26th April for a limited 6 week season. Described by esteemed American critic Edward P. Morgan as ‘One of the most magnificently moving pieces I have ever seen on any stage’&, and celebrated throughout the world, Man of La Mancha& at last returns to the West End in a new production for the first time in 50 years. Performed on the magnificent stage at the London Coliseum with the ENO’s 35-piece orchestra, it is set to be the theatrical event of the year.